It all began around 1998, when two long time friends who used to spend their summer vacation together, Andreas V. – guitar and Vagelis Lekos – bass, decided to form a band, eventually named “Floating Worlds”, after various changes. After a lot of failed attempts to record their first songs, they succeeded in completing their first album, titled “Only A Dream, Can Kill A Dream…” in the autumn of 2007. Following the completion of the recordings, the obvious need to promote the new record through live performances, made the search for permanent band members imperative and finally the first gig of the “Only A Dream… Tour ’10 – ‘12”, took place on May 2010. This tour came to an end after 17 gigs in July 2012 with a lot of lineup changes, of which the most important and crucial for the future of the band, was the taking over of the male vocals by Jon Soti, on November 2011. The band entered the studio in December 2012, in order to record their second full length studio album, entitled “Below The Sea Of Light” which was released on October 1st 2013. In February 2014, the premiere show of the “Sea Of Light Tour ’14 – ‘15” took place in Athens, Greece. The milestone of this period definitely was the first European tour of FLOATING WORLDS in March 2015, simultaneously with the return of Sophia Assarioti on keyboards and female vocals and the taking over of the bass by Mike Papadopoulos. In November 2015, the “Sea Of Light Tour ’14 – ‘15” ended with four memorable shows in Serbia and immediately afterwards, the group entered a two year period of composing the songs of their third album entitled “Battleship Oceania”, the recordings of which were completed in the end of 2017 with Nikitas Mandolas on drums. 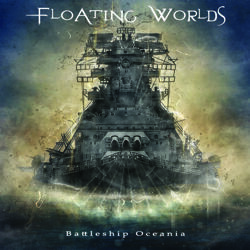 “Battleship Oceania” is going to be the first concept album from FLOATING WORLDS, narrating the story of a legendary battleship and its crew. Through the unexpected revelations and events that take place as the story evolves, the listener takes a close look at the ugly face of war, the manipulations of vain people interested in power and money and the obscure role of global media but he also has the opportunity to witness the self-sacrifice for the greater good, the sincere repentance and the greatness of forgiveness. In order to celebrate the completion of this long task, the band performed a small number of shows, for the first time in Russia, in March 2018. “Battleship Oceania” is set to be released on May 17th 2019.